Heat dutch oven over coals to about 350 degrees for Frying. Add ground beef, and chop and stir until well browned. 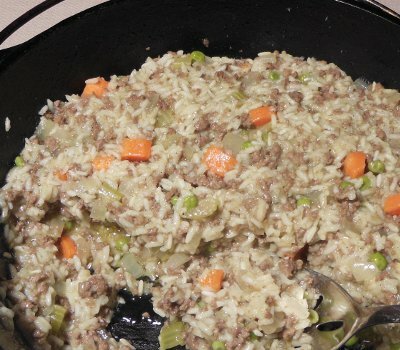 Dice onion, celery, and carrot, and add to ground beef. Mix in peas, garlic, ginger, and curry powder. Stir in rice and water, and bring to a boil. Sprinkle salt on top, cover, and reduce heat to about 225 degrees for Simmering. Simmer, stirring every 15 minutes, until rice is soft - about 40 minutes. Let me know how you enjoyed your Beef Curry!